Does Sunrider Calli Tea have caffeine in it? hy All These Incredible Benefits From “Just” Teas? The first important thing to remember about these teas is that they are not really teas, but rather highly concentrated food herbs that just happen to be dissolved in water. Modern nutritional science is just beginning to discover some of the amazing properties of whole foods and the magic of herbs. Sunrider teas are alkaline in nature. In an alkaline environment, impurities are less likely to be absorbed into the body during digestion. The concentrated foods in Calli and Fortune Delight have traditionally been known for thousands of years to nourish and balance the cells and glands associated with cleansing toxins from the body. Like carbon buildup in a car, toxins within the body inhibit proper functioning. If the major filter for toxins in the body – the liver – is overwhelmed, then it cannot properly deal with its many functions. These include: fat metabolism, (overweight), blood sugar regulation, (energy problems), cholesterol control, (heart disease), protein and hormone regulation. Some health practitioners attribute all health problems to some manifestation of toxins. Sunriders don’t necessarily understand why these teas work so well. They just know they feel better! Minneapolis Sunrider, Jerry Urbanak, had a remarkable change from using Calli. He went to the University of Minnesota to have his cholesterol checked and to test out a chemical for lowering cholesterol in a study sponsored by a drug company. His cholesterol was measured at 261. He postponed entering the study to give Sunrider foods a try. After a month of eating Nuplus, Quinary and drinking Calli morning, noon, and night, he went back to the university to have his cholesterol level rechecked. It had dropped to 191 – a drop of 70 points in one month! Since Jerry’s cholesterol level had dropped below 200, he could no longer be in the study, but he was not complaining! Jerry said he felt his body go through a physical transformation and experienced a profound effect in his health. A year later he is 13 pounds lighter, and still holding his lower cholesterol level! oes Calli Have Caffeine In It? It has been seen that “catechins” in tea leaves can cause cancer cells to self-destruct. Catechins are contained within the tea tannins. Green tea has tannin at 12-13% while black tea has tannin at 6-7%. The problem is that tannin as a whole food is not good for us. Sunrider blends green and black tea together with many other herbs. The Sunrider formulation process decreases the ill effects of tannic acid and caffeine while increasing the concentration of the good catechins. These products are not processed the same as many of the other Sunrider herb products. The tea leaves are soaked at very specific temperatures for very specific amounts of time. They are not squeezed, but rather hung to drip. The time and temperature cycles are the secret in creating these most unique products. And although we cannot say that these beverages are caffeine free, we can say that you will never see the ill-effects of the small amount of caffeine, due to the balance and harmony of the ingredients and the results of the unique processing. Like the NuPlus, these beverages are extremely high in antioxidants, proven by measurement, with the high pressure liquid chromatography process (HPLC). Calli actually helps get you OFF caffeine! John Finnigan in his book, “Recovery From Addiction,” states: “The best and most remarkable formula I have seen for helping to free people from caffeine addiction is Calli tea. I have been amazed by the number of people who have told me that as soon as they began drinking Calli, they lost all craving for caffeine and were able to completely quit coffee and cola addictions with ease!” Finnigan explains that all addictions, whether caffeine or sugar or drugs, are related to a weakened or congested liver that cannot provide the proper energy to the body. The Shao Lin priests of China originally developed the Calli formula to help them concentrate during their long periods of meditation. The clearer, more focused thinking that it produces seems to come from improved body cleansing which is now considered the formula’s main benefit. The original Fortune Delight formula was made to help heal the internal injuries that were a result of martial arts fighting. It works on the muscles, tendons and ligaments and helps the kidneys remove toxins from the body. Exquisite care is taken in the planting, harvesting, and creation of present-day Calli. Where many herbal teas are simply chopped up herbs in tea bags, such is not the case with Calli. First, the carrier leaf - the Camellia Leaf - is slowly dried, turned over and slowly dried the rest of the day. In a separate process, the various other herbal ingredients are extracted and concentrated. This concentration is sprayed on the carrier leaves, layer upon layer, one ingredient at a time. This complicated process brings you a herbal formula so concentrated, that one tea bag makes one to two quarts of tea, depending on how you like it. This same care is also taken in adding flower essences to Calli Fresh and Night Calli. Flower buds are carefully picked and then gently heated to open them up for maximum freshness. This allows you to enjoy the benefits of aromatherapy as you are enjoying a hot steaming cup of these wonderful drinks! People concerned about the harsh effects of free radicals (related to cancer, heart disease, diabetes, and aging) must remember that a big source of free radicals is the body’s own manufacture of them during inefficient metabolism. Sunrider foods support the best antioxidant known – a healthy, balanced body, and nourish it with plant-based free radical fighters. One of the most powerful Sunrider formulas for this is Fortune Delight! And if you are also looking for a chlorophyll source, don’t forget that Fortune Delight contains brown chlorophyll, which is much more easily assimilated than green chlorophyll. offee – North America’s Worst Drug Habit? Coffee contributes absolutely nothing to the total human body chemistry, but it can harm your liver, kidneys, heart, bladder, digestive tract, bones, teeth, skin, growing fetuses and new-borns – to name a few. It can cause weight gain and fat retention. It contains absolutely no nutrients, no vitamins, no minerals, but it does contain a deadly drug known as caffeine. Caffeine is a powerful stimulant and can produce insomnia, restlessness, anxiety, muscular tremors, and in some individuals, caffeine may cause deep mental depression. The action of caffeine on the human heart is so stimulating and damaging that when a person has a heart attack, high blood pressure, kidney or bladder disturbance, normally their physician will prohibit any coffee or caffeine. 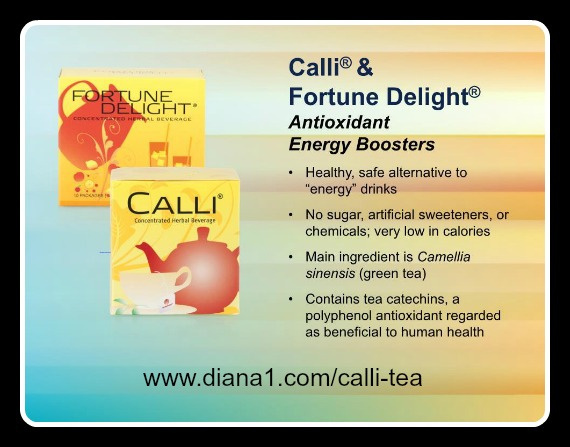 Most people have wanted to get away from coffee, but they were not able to until they received the balancing effects of Calli and Fortune Delight. re All Herb Teas The Same? Sunrider, being food-grade rather than medicinal-grade herbs, has none of these harsh or dangerous effects. Not only have thousands been enjoying Sunrider teas for over 17 years with only positive benefits, but also the original Chinese formulas have been used safely for over 5,000 years! For those of you who have too much stress in your life, there is a Night Calli which contains special herbs to nourish and balance the nervous system. Don’t just drink it at night though – it’s good for you the whole day too! It won’t put you to sleep at work, and you will be calm yet alert! During the day, you can try the Calli Fresh which also is related to relaxation but has the added “freshness” for the day. Other Calli flavors include: Regular, Peppermint, and Cinnamon. Fortune Delight flavors include: Lemon, Cinnamon, Regular, Raspberry and Peach. Do not use boiling water and do not microwave (this destroys the live enzymes). Leave the Calli bag in for 2 to 5 minutes and then take the bag out to remove formation of any bitter taste from the tea leaves. Do not use the Calli bag a second time as the nutrition is dissolved from the carrier leaves during the first “steeping.” Dissolve Fortune Delight in hot water, using 4 to 6 cups. Try both Calli and Fortune Delight iced – they’re delicious. Remember first to dissolve the Fortune Delight powder in a small amount of hot water (it dissolves better in hot water) then add cold water. Prepared by an independent Sunrider distributor as nutritional information only.